ALBUQUERQUE, N.M. — If you find yourself craving more salads and even cooked greens as the weather heats up, don’t sweat it. On second thought, that’s exactly the point. As the temperature warms up, and we sweat to stay cool, we also start to crave foods with higher water content to replenish our supply of fluids. Some great summer foods and their water content include: lettuce and cucumbers (96 percent), daikon (95), zucchini, radish and celery (95), tomatoes (94), green cabbage (93), cauliflower, eggplant, red cabbage, peppers and spinach (92), watermelon (92), peaches (88), apples and pears (84). 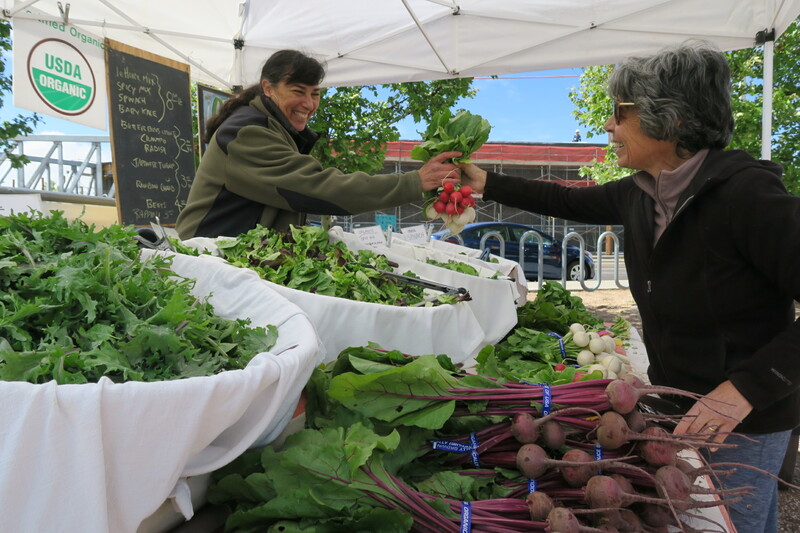 Natasha Gunderson of Mr. G’s Organic Produce tends a customer at the Santa Fe Farmers’ Market. 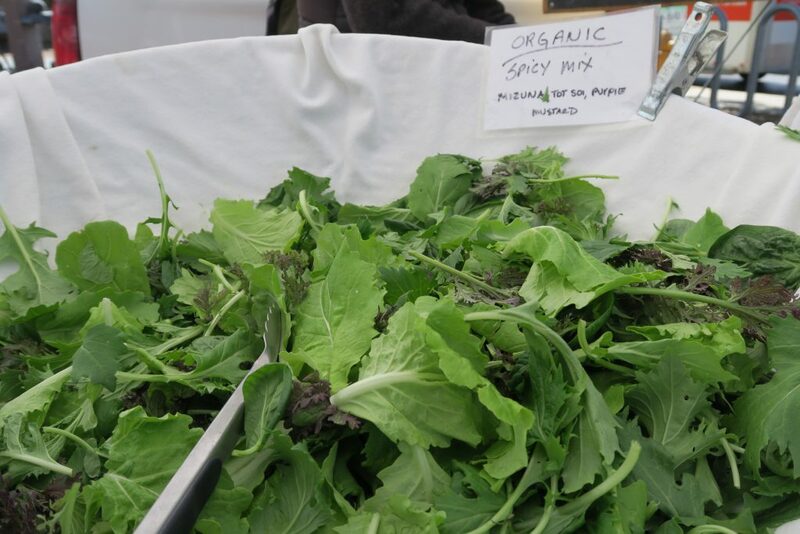 A wide variety of greens are available this month from local sellers. All of these cooling fruits and vegetables are grown in New Mexico and can be found at your local growers’ markets, but many won’t be available until July or August. This is only June, you say? While June is considered early summer for most crops here, there are plenty of tasty foods at your local growers’ market right now, especially when you know what to expect. Some of the best early summer fruits and vegetables likely to be available now include radishes, turnips, spring onions, carrots, baby bok choy, leeks, sprouts, microgreens, strawberries (when available), apricots (if they survived frost and hail), and LOTS of greens. You probably already know that eating salad and cooked greens are good for you. The easiest rule of thumb when it comes to vitamins, minerals, and even protein contained in greens is that the darker the color, the better the nutritional punch. If you prefer lighter color salad greens, try adding a mix of some darker ones into your bowl. It’s also worth remembering that two cups of raw leafy greens is equal to one serving of vegetables if you’re trying to hit or exceed your “Five-a-Day” goal. Once you get home, be sure to put your greens straight into the refrigerator. The four basic factors that affect its nutrient composition are exposure to air, light, heat, and length of time in storage. Experts say that vitamin C, vitamin B6 and carotenoids are good examples of nutrients that are highly susceptible to heat, and for this reason, their loss from food is likely to be slowed down through refrigeration. Do not wash greens before storing as this will cause them to become limp. Beet and turnip greens (and carrot tops) should be trimmed off before storing in a separate plastic bag where the greens should keep for about four days. Greens left on will pull moisture away from the beets, turnips and carrots. Kale should be stored in the refrigerator crisper wrapped in a damp paper towel or placed in a perforated plastic bag. Kale can be kept in the refrigerator for several days, although it is best when eaten within one to two days since the longer it is stored, the more bitter its flavor will become. Cooked kale will keep for two days refrigerated. Spinach should be stored loosely in a plastic bag and placed in the refrigerator crisper where it will remain fresh and retain its nutrient content for about four days. All salad greens should be washed prior to eating. Dry your lettuce by spinning or rolling in a dish towel and allowing to air dry. Gently tear the leaves for a salad, or if you are making a chopped salad where all your ingredients end up the same size, chop with a chef’s knife. Chard: Remove the large red or white stem in the middle of the leaf as it is tough. Simply fold the big leaf in half and cut out the big stem. Beet greens: If they are still attached to the root, cut leaves off at the stem where the leafy portion ends. (The portion of the stem between the leaf and the root is too tough to enjoy.) Rinse the leaves under cold running water and cut into ½-inch slices. Do not soak the leaves in water as water-soluble nutrients will leach into the water. Warning: once you get hooked on locally grown greens, there’s little comparison in terms of selection, flavor and value. To find a farmers’ market near you visit farmersmarketsnm.org. And read Five Reasons to Buy Local Salad Greens. When you buy beets from your local farmer, you get two foods for the price of one: the nutritious bulb and the tasty greens! This warm salad makes use of both the beet bulb and the greens. It can be served in larger portions alongside rice, or as an accompaniment to roast chicken or pork. And you might love the dressing so much that you serve it with other foods! Head here for this tasty recipe. 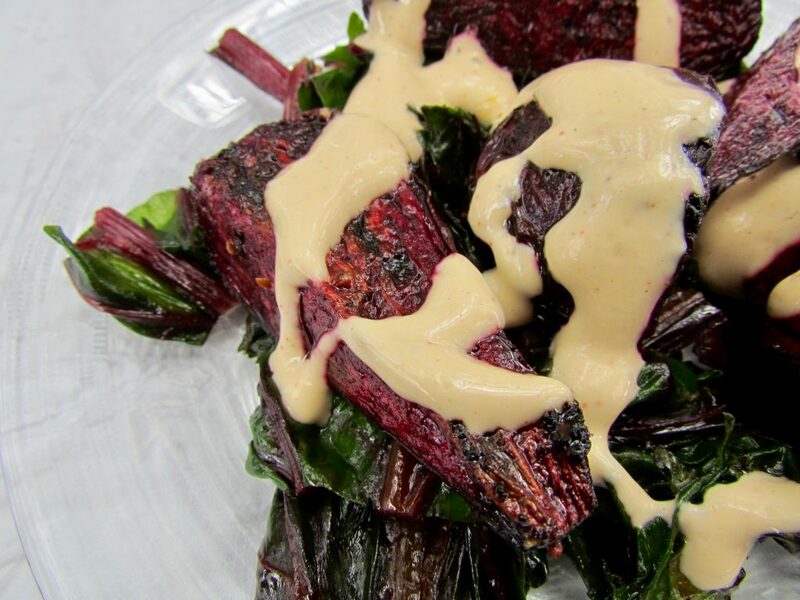 The creamy red chile dressing is a delicious topping for the sweet beets! Bringing out a sweeter taste from these greens by doing a “quick boil.” This will free up oxalic acids and allow them to leach into the boiling water. Discard the boiling water after cooking; do not drink it or use it for stock because of its acid content. 1) Use a large pot (3 quart) with lots of water and bring to a rapid boil. 2) Add greens to the boiling water and boil for one minute. Begin timing as soon as you place the beet greens in the pot if you are using one pound or less of beet greens. (If you are cooking larger quantities of beet greens bring the water back to a boil before beginning timing the one minute.) Do not cover the pot when cooking beet greens. Leaving the pot uncovered helps to release more of the acids with the rising steam. 3) Remove greens from pot, press out liquid with a fork, place in a bowl, toss with Mediterranean Dressing and top with your favorite optional ingredients. • Spinach should be tender, brightly colored, and not mushy when it’s done. • For best flavor, use a knife and fork to cut the cooked spinach crosswise several times until it is in very small pieces. The more finely you cut spinach the more exposed surface area you create. This allows more flavors of the dressing to pass into the spinach and will create tenderness. • Consider adding to cooked spinach: chopped tomato, kalamata olives, cashews or goat cheese. This tasty dressing can be used on a variety of salads or cooked greens. It is also a healthy alternative to pre-made bottled dressings that are often high in untested fats, salts, sugars, fake flavors and colors. In a blender, combine garlic, jalapeño pepper, Dijon mustard, vinegar, lemon juice and anchovies (optional). Blend at high speed for 20 seconds, leave blender running and slowly pour in olive oil. Toss with lettuce or greens of your choice. Spicy salad mix is fantastic for summer meals. ARUGULA: With its peppery flavor, arugula is great for spicing up your salad. Its leaves are dark green, small and feathery, but it ranks near the bottom of greens for nutrition. Try mixing arugula with more nutrient-dense options to pump up the flavor and the antioxidant power of your salad. The peppery flavor pairs well with sweet additions like sliced strawberries or watermelon, and with assertive flavors like blue or feta cheese. BEET AND TURNIP GREENS: Both beet and turnip greens are extremely healthy and often tossed out once their bulbous roots have been trimmed off. When choosing beet greens that are attached to the roots, choose smaller roots over larger, tougher ones. These greens should look crisp and have a bright or deep green color. June is an excellent time to find young, tender beets and turnips. BUTTER LETTUCE: Including both Bibb and Boston varieties, butter lettuce has a soft, buttery texture and a slightly sweet flavor. It has a tightly folded head of leaves that are bright green on the outside, and is often sold with the roots attached to preserve freshness. Generally sweet with soft leaves, butter lettuce is great addition to any salad. CHARD: Swiss chard is a relative of the beet family, and it is loaded with vitamins. You can recognize it by the large leaves with red, yellow, orange or white veins. Some people who don’t like kale feel more at home with the milder flavor of chard. Remove the thick middle vein before chopping the chard into salad, or cooking it with a quick boil method. KALE: Don’t let kale’s trendy status scare you away. These leafy greens are a powerhouse of nutrients. Some popular varieties are: curly kale (leaves are green or purple and very curly); lacianto kale, also called “dinosaur kale” (dark green with ribbed or wrinkled-looking leaves); red Russian kale (flat, fringed leaves that are reddish-purple and resemble big oak leaves), and baby Russian kale (a smaller leafed version). The lacianto and red Russian kale are sweeter than curly kale, but you will want to cut out the middle stems as they are fibrous. If you’re not yet a fan of raw kale, try massaging it with a bit of lemon juice and kosher salt to soften it up. You may find that cutting raw kale into smaller pieces makes it taste better, so try stacking and rolling the leaves, and slicing strips perpendicular to the roll “chiffonade” style. LEAF LETTUCE: Red or green, this lettuce is a good base for any mix as it has a mild flavor, making it a good choice for getting vitamins into the diet of children and picky eaters. Like most salad greens, leaf lettuce does not contain large amounts of fiber so you can increase the fill-factor by adding high-fiber veggies such as cauliflower, cabbage, peppers, or celery to your salad. SPINACH: Spinach is mild flavored, but its dark, vibrant color tell you that it is packed with vitamins and fiber. Spinach also contains more folic acid than most salad greens, which helps convert the food you eat into energy and produces healthy red blood cells. Try pairing spinach with strawberries, balsamic vinegar and a sprinkle of feta cheese for a delicious warm-weather salad. QUELITES: This wild spinach grows along the river and acequias, and its dark green leaves are smaller than spinach and chard. Quelites are often found at growers’ markets in the north, and sometimes in Albuquerque. You can store and prepare qualities exactly as you would spinach. Try cooking with local onions and garlic, or try them with the creamy red chile dressing. MIZUNA: You’ll know mizuna by its leafy, feathery look and medium-dark green color. Associated with the mustard family, it is often found in mesclun salad mixes. Its young leaves (smaller) taste best when used raw, while the older leaves (larger and firmer) should be lightly cooked. Mizuna is a cold tolerant plant making it popular with farmers and gardeners in cooler regions such as the east mountains and northern New Mexico. There are a number of varieties but usually this green is just labeled as “mizuna” at markets.